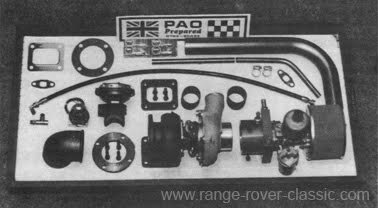 vehicles like Range Rover and Rover passenger car in the 70's and 80's. 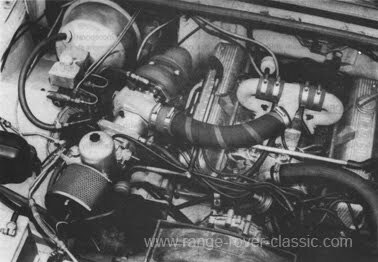 Even today Allard turbo charging systems are offered via the company Allard Turbo Sport Ltd, especially for improving turbo diesel engines. the installation suitable for right and left hand drive vehicles. A special connecting exhaust pipe linking the two exhaust manifolds incorporates a wastegate boost pressure regulator valve, which is designed to limit maximum boost to 5.0 p.s.i. to maintain maximum engine reliability. dissipated by the exhaust turbine. hot spot and brake servo vacuum union, and fitted with a non-restrictive paper element air filter. in the installation, together with boost pressure gauge and set of 'colder' grade spark plugs. un-turbocharged engine. Low speed pulling power and flexibility is also substantially improved. NOT appreciably increased, and in many cases is ACTUALLY IMPROVED. On the road, it will be immediately apparent how quiet and smooth the engine is, yet the extra power Rapport Ltd in UK offered the Range Rover Rapport Turbo conv. optimum turbocharger throttle response and efficient operation. is contemplated, as the turbocharger and engine must have an adequately cooled oil supply. engine oil should be changed regularly. ROVER, PARTICULARLY WHEN HEAVILY LADEN. WHY NOT TRY IT !!! WE'RE SURE YOU'LL LIKE IT!! Our demonstrator is available by appointment. much more simple turbocharging system for most engines. Controls include a boost control valve, which limits maximum boost pressure according to the spring fitted, and an exhaust 'wastegate' by-pass valve. Universal or prototype installation kits for four, six and eight cylinder engines comprise the main components you will need for a complete installation to be made upon those vehicles for which we do not hold in stock a complete kit. 6000 ex., and can offer an advisory technical service to ensure that the 'd.i.y.' installation is a complete success. for £5.00 including postage and packing. This turbine wheel drives, on a common shaft, a small compressor turbine. This compressor pumps air into the engine, thus providing a denser charge of air and fuel. power output. The increase is approximately proportional to boost pressure. 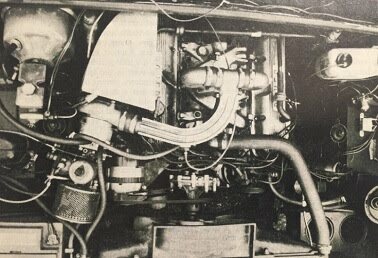 The strength and design of the original engine limits the amount of 'boost' that may be used. For road vehicles between A p.s.i. and 9 p.s.i. is common. it to do the job of a large engine, whilst retaining the economy of a small unit. and quietness, with the major advantages of sensible fuel consumption and low exhaust emissions. (c) Will Turbocharging damage an engine? (i) the amount of boost given is strictly limited, preferably by a 'wastegate'. and is properly engineered to take account of the extra heat generated under the bonnet. (d) How much faster will a Turbocharged vehicle go? speed of a vehicle, unless they intend to offer a package of other modifications. (e) How much more power will a turbocharger produce? require a reduction in the compression ratio of the engine. piston or a wrecked engine. (f) Will a turbocharger invalidate the warranty on a new vehicle? long term testing. Some suppliers may soon be able to offer their own warranty on engine and transmission. Normally, they only guarantee the turbo installation itself. (g) How will my insurance be affected? Our Broker has usually been able to obtain cover with a loading of only 157», subject to the driver's record. 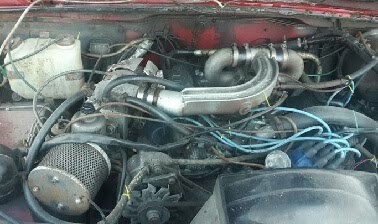 (h) How much will it cost to have a turbocharger fitted? P.A.O. Allard Turbosystems range from £800 to £1750 fitted. They all include an engine monitor gauge and, where necessary, an oil cooler. In certain cases, a reduction in engine compression ratio will be required, for full engine reliability. P.A.O. Allard offer a wide range of standard conversions and can quote for prototype work. For further details contact ourselves, or an authorised Dealer.